Keeping traffic out of your neighborhood doesn’t work. TXDot released a map of the most congested roadways in Texas. There is only one East/West road in Austin on the list – Slaughter lane. I know when I lived at Dittmar and Mancaha there was quite a lot of concern about another neighborhood going in around the corner and what it would do to traffic. A lot of these projects were not pursued due to neighborhood opposition. 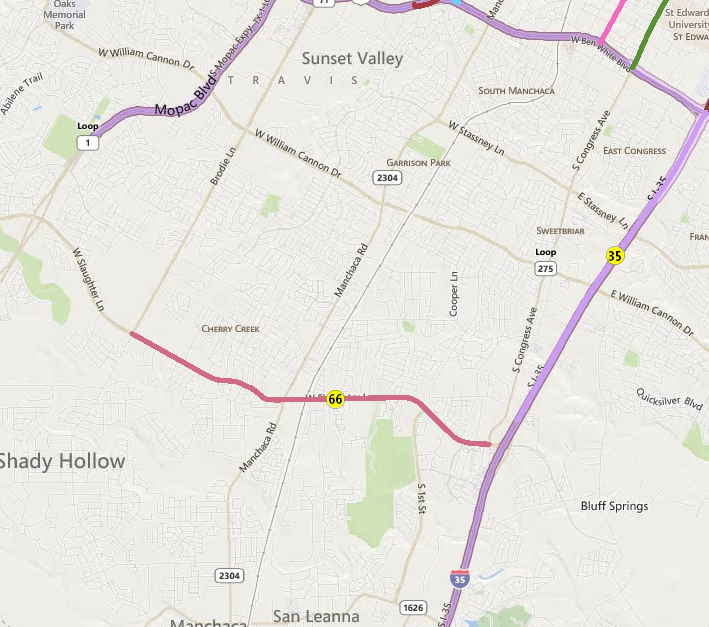 You can see that there’s a lot of undeveloped space between Mancaha and South Congress. This picture illustrates perfectly how pushing development away from you can still clog up the streets near you. Looking at the map you can see that Slaughter connects to IH-35 and MoPac shortly after that they become congested heading Northbound. We can assume that very few people living North of Slaughter are driving south to catch more of the congestion as they head into the city. So the majority of this congestion is coming from the amazing curlicues of culdesacs and sprawl south of Slaughter Lane. The sprawl got pushed away, but it ensured that Slaughter was congested. It ensured that IH-35 and MoPac congestion started further south. In short the neighborhoods that pushed these residents away ended up getting all the traffic downsides, without any of the upsides of more people – better buses, more walkable stores, parks and amenities.